If you like golf, you've come to the right place. 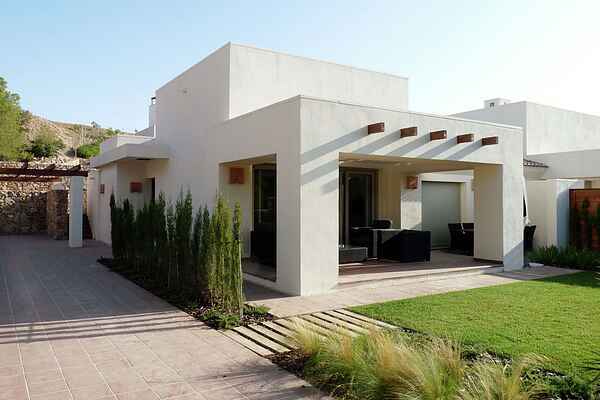 This villa is situated at the end of a cul-de-sac in the luxurious Las Colinas Golf & Country Club, which has received several awards over the years. Las Colinas Golf and Country Club is an exclusive resort in the Campoamor-Orihuela Costa region, set in 330-ha grounds in the valley between the hills and the sea. The resort offers many facilities, including a magnificent Club House, a great sushi bar and a small supermarket. The holiday home is nicely furnished and you'll feel straight at home in the living room with its comfortable lounge area. The sliding doors open out onto a covered terrace, also furnished with a nice lounge set. The 18 hole golf course was designed by the internationally renowned Cabell B. Robinson. It offers some stunning views across the valley and of the hills and the Mediterranean Sea beyond. Afterwards the terrace of the wonderful club house is a great place to be. Children can play in the communal pool, just 100 metres from the holiday home. Residents of Las Colinas can get exclusive access (fees apply) to the Beach Club on the beach of Orihuela (5km). It offers a wonderful swimming pool, a spacious sun terrace with loungers, parasols and towels, and amazing views of the blue Mediterranean Sea. A valid QR code pass is required for access to the Beach Club and this must be applied for by the owner in advance. Please note! During the months of July and August, you can only make use of the Beach Club terrace and not of the other facilities. Do you like shopping and tapas? Then visit the atmospheric city centre of Murcia (40 km), with its beautiful cathedral. Pay attention to the baroque façade that expresses the spirit of the Levant coast. Additional information: The minimum rental period for cots and high chairs is 1 week. Las Colinas Golf and Country Club is continuously developing in order to further improve its high standard. LAS COLINAS: Award winner Best Resort and Best Golf Course in Spain in 2015 and 2016 !! At Las Colinas is a very wide range of entertainment. In the summer months there are opportunities for sailing, falconers, balloonflights, childrens club (English), bike rental, etc. On the golf course you can get golflessons. In the immediate area, the famous mud baths of Lo Pagan, you can have a very nice day out of and finish with a drink and tapas on the boulevard. Do you want to snorkel or dive, you can drive to Cabo de Palos. This lovely port town has several beautiful bays with plenty of diving / snorkeling. You can also get here the PADI diving courses. In July and August, entrance fee to the exclusive beach club. The prices for this are usually comparable to renting a bed on the beach. The sea in the summer, plenty of entertainment in and around the water (Banana, Watercraft, Para-sailing, watertoys , Peddling etc). In the simmer evenings at the golfclub Enso Sushi Bar with super fresh sushi!